Alcoholism tends to run in families. It is well established that children of alcoholics (COAs) are at both biological and environmental risk for a myriad of social, emotional, and behavioral problems., These children are at risk for externalizing, and internalizing problems. A number of environmental mechanisms may underlie this risk, including exposure to impaired parenting, family conflict, and high levels of life stress. Parental substance use may interfere with parents' abilities to remain warm during parent–child interactions. Less nurturing parenting may disrupt children's sense of security and increase the risk for later depression. Families of alcoholics are found to be a vulnerable place for children to become aggressive. The association between alcohol and problem behaviors may have its roots in early self-regulation difficulties. It has been hypothesized that COA parents are at greater risk for temperamental difficulties manifested as negative affect,,, high activity level, and attention problems, which can adversely affect the development of such self-regulatory capabilities. As such, the capacity for internalization of rules and behavioral control in these children may be impaired leading to later conduct problems. Indeed, high activity level and negative affect have been associated with the development of problem behaviors among COA parents and with later substance use., Thus, COA parents are at increased risk of behavioral regulation difficulties that may prevent the expected normal decline in aggressive behavior. Studies conducted in the past have reported that certain temperament deviations in childhood may increase the risk for alcoholism in adulthood. [l7] Temperament is defined as early-appearing and relatively stable differences in emotional reactivity and regulation. It has been suggested that temperament and parental alcoholism may interact to predict subsequent behavioral problems. Temperamental factors, specifically high activity, high emotionality, low capacity for self-soothing, low attention span-persistence, and low sociability are associated with a high risk for alcoholism and may be a reflection of the child's genetic liability to later addiction. As early as infancy, apparent markers of temperament including high novelty seeking and low harm avoidance, appear to predict adolescent onset of drinking., Several previous works have established relations between low temperamental reactive control and low resiliency in childhood and disruptive behaviors and substance abuse in adolescence. Other work links novelty seeking, high physical activity, low behavioral control, and negative emotionality with alcoholism.,,,, Thus, the risk for adolescent substance misuse may be identified in early childhood through temperamental traits. With this background, this study was conducted to compare the levels of externalizing and internalizing behaviors, aggression and temperamental difficulties in children with or without a parental history of alcoholism. Study sampling was purposive. The study group comprised of 30 school-going children (17 males and 13 females, age range 9–14 years) whose biological fathers attending the De-addiction Clinic, Department of Psychiatry, Sri Ramachandra Medical College and Research Institute, Chennai, met the ICD-10 criteria for Alcoholism. Thirty age- and gender-matched children from the schools were taken with no parental psychiatric illness (ruled out through detailed psychiatric history and examination) and mother scoring <4 on the General Health Questionnaire (GHQ-12), to prevent any influence of maternal psychiatric disorder on the study outcome. In this study, the independent variable is the presence of alcohol dependence in the father. However, the dependent variables assessed are also expected to be influenced by other confounding factors and other independent factors unrelated to alcohol dependence in the father. Hence, these confounding factors were addressed by adopting a case–control design, so that the children in the two groups differed only with respect to the alcoholic status of the father, all other psycho-socio-demographic variables were matched between the subjects of the two groups automatically because of the study design; meaning the subjects in either group were similar regarding all other independent (possible confounding) variables. The inclusion criteria for the study group were: father diagnosed with alcoholism; having no other known psychiatric illness; aged between 9 and 14 years; with mother having GHQ scores <4 and living with the index parent for at least the preceding year. The exclusion criteria were: children with major medical, neurological, or psychiatric illness; children with intellectual disability (IQ<70), or a diagnosis of autism or Asperger's disorder. The written informed consent for participation was obtained from all the parents of the children who participated in this study and the children provided written assent. The study period was January–March 2017. All the assessments were done by the second author. First, the mother was screened using the GHQ-12 item version for psychopathology in both groups. Children whose mothers scored above the cutoff on the GHQ-12 were excluded from the study. The mother was interviewed by the second author using a sociodemographic data sheet (developed for the study), the Child Behavior Checklist (CBCL), Aggression Questionnaire, and the Malhotra's Temperament Schedule (MTS). GHQ was used for measuring the psychological well-being. Each item was assessed on a 4-point Likert scale (less than usual, no more than usual, rather more than usual, and much more than usual). Minimum score is 12 and the possible maximum score is 48. Cronbach's alpha coefficients ranged from 0.82 to 0.93. CBCL for ages 6–18 is a widely used measure of children's behavioral/emotional problems, with well-established psychometrics. Mothers reported whether a given behavior described his/her child's behavior within the previous 6 months using a Likert rating of 0 = “not true,” 1 = “somewhat or sometimes true,” or 2 = “very true or often true” for each item. Scores from internalizing and externalizing scales of the CBCL were analyzed. The construct of “internalizing” consists of items from anxious/depressed, withdrawn/depressed, and somatic complaints subscales, with rule-breaking and aggressive behavior subscales comprising the “externalizing” construct. Higher scores indicate more behavior problems. Aggression questionnaire was used to assess the trait aggression in children. It consists of 34 items. Each item was answered on a 5-point Likert scale ranging from 1 (not at all like me) to 5 (completely like me). The questionnaire measures five constructs related to aggression: physical aggression, verbal aggression, anger, hostility, and indirect aggression. Scores can range from 34 to 170, with higher scores indicating more aggressive behaviors. The internal consistency ranges from 0.55 to 0.94. Child temperament was assessed using MTS. This scale measures nine temperamental variables identified by Thomas and Chess. There are 45 items in the schedule covering nine dimensions. The nine variables have been reduced to five factors using the factor analysis. Factor I (Sociability) comprised of approach/withdrawal, adaptability, and threshold of responsiveness. Factor II (Emotionality) constitutes mood and persistence. Factor III (Energy) includes activity and intensity. Factor IV (Attentivity) measures distractibility. Factor V (Rhythmicity) is retained as an independent factor. Each item is rated on a 5-point scale. Scores of 1–5 represent the extremes of intensity and frequency of occurrence of that behavior rated on negative and positive directions. Mean scores for each of the variables are computed by dividing the total scores by 5. The MTS is reported to have high test-retest reliability (0.83–0.94) as well as high validity. All the data obtained were analyzed after using SPSS (SPSS for Windows, version 20, SPSS Inc., Chicago), using the Student's t-test. A comparison of all the parameters - behavior problems, aggression, and temperamental difficulties was made between the study group and the control group. The sociodemographic profile of the study and control groups is shown in [Table 1]. The age of the children in the sample ranged from 9 to 14 years. Of 60 children included in the study, there were more males (56.67%) than females in both study and control groups. Around 56.67% (17/30) of the alcoholics had been drinking nearly for more than 15 years. The scores on the CBCL were analyzed based on the two subscales – Internalizing Scale and Externalizing Scale. [Table 2] shows the scores obtained by the two groups on the two scales of CBCL. As can be seen from the table, the COA-dependent parents obtained statistically significant high scores on the externalizing scale and a marginal high score on the internalizing scale. [Table 3] presents the data obtained from the Aggression Questionnaire. As can be seen from the table, the children of alcohol-dependent parents obtained statistically significant high scores on the Aggression Questionnaire. They were found to be more aggressive, impulsive, hostile, and bullying than the controls. [Table 4] contains the scores obtained on the MTS. There is a statistically significant difference between the two groups on the MTS, with children of alcohol-dependent parents manifesting temperamental difficulties. They differed significantly from the controls in being less rhythmic, less adaptable, more withdrawn, more distractible, with a lower threshold of responsiveness and displayed negative emotionality. The prevalence of alcoholism in India is reported to be 21.4%, and there is an increasing alcohol consumption among the youth. COAs are at substantially increased risk for becoming alcoholics themselves, and this elevated risk appears to be a function of both genetic and environmental factors. Studies conducted in India have reported both externalizing, and internalizing behaviors, among the children of parents with alcoholism. The current study examined whether COAs were at greater risk for externalizing and internalizing problems. In this study, we found that there was a statistically significant difference between the COAs and the non-COAs on the externalizing and internalizing subscales of CBCL. The findings of the present study and those of previous research show higher levels of externalizing and internalizing problems among COAs in contrast to children of controls. Genetic factors play a crucial role in the etiology of alcoholism. In an earlier study, King et al. observed strong relations between parent alcoholism and higher levels of child behavioral disinhibition within biological but not adoptive families, implicating a genetically transmitted vulnerability to externalizing spectrum disorders among children of parents with alcoholism. In terms of externalizing problems, the current findings indicate that having a parent with substance use predicted externalizing behavior. Moreover, parents with alcoholism may not provide consistent support to their children which may contribute to elevated rates of children's externalizing problems. Similar findings have been reported by Bountress and Chassin in a study involving children of parents with substance use disorders. Less consistent parenting may allow children to associate with deviant peers who maintain children's externalizing behaviors. These findings have been replicated in other studies, such as those by Dishion and Owen. In predicting internalizing problems, the results of this study demonstrate that the offspring of alcoholics are at statistically elevated risk for internalizing behavior. Differences in internalizing symptomatology were observed between the COAs and the non-COAs. Alcoholic families have been characterized as being high in marital conflict, antisocial behavior, and depression, all of which have been shown to have a deleterious effect on parent-child relations and may in turn influence the development of child behavior problems., In secure relationships, children can regulate their negative emotions through guidance and nurturance from the caregivers. Whereas children of inconsistent parents (such as COAs) may learn to under-regulate or over-regulate their emotions, possibly leading to later internalizing and externalizing behavior problems reports Sroufe. Results of the current study indicated that COAs have obtained high scores on the aggression questionnaire in contrast to children with non-alcoholic parents. There are several variables that may influence the development of aggression, both in isolation and in interaction with one another. Patterson observed that a spiralling chain of exchanges between parent and child with increasing levels of negative affect leads to a coercive cycle that promotes the development of children's aggressive behavior. Negative affect, a dimension of parenting has been consistently associated with the development of externalizing behavior problems., The literature on COA parents suggests that one pathway to maladjustment among these children is through the associations between lack of adequate early behavioral control with externalizing behavior problems leading to conduct disorder and delinquency,, a pattern primarily seen in boys. These children generally start with milder forms of aggressive and noncompliant behavior, their conduct problems may become serious over time and may lead to adolescent antisocial behavior. Early temperament dysregulation may increase risk for childhood behavior problems that in turn evolve into substance abuse during adolescence. In line with previous Indian research, we found that COAs had manifested temperamental difficulties. They differed significantly from the controls in being lower on rhythmicity, less energetic, highly distractible, having pronounced negative emotionality and tending to withdraw in social situations. It has been suggested that these temperamental characteristics may represent biobehavioral dispositions that reflect genetic liability to alcoholism. These temperamental characteristics may be indicative of behavioral dysregulation and may lay the initial groundwork for later maladaptive developmental patterns and even addiction.,, Moreover, there is some evidence to suggest that temperamental difficulties might mediate the relationship between parental alcoholism and childhood problems. Blackson et al. evaluated this hypothesis among 10–12-year-old boys and reported that a “difficult affective temperament” mediated the relationship between paternal alcoholism and child maladjustment. 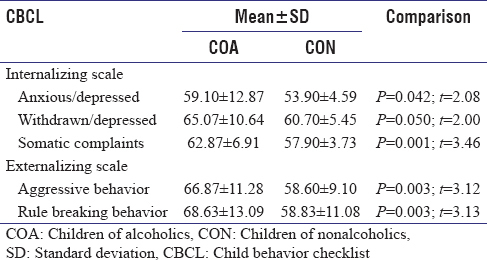 These results suggest that a child with a genetic predisposition for substance abuse, raised in an alcoholic environment, may be at a heightened risk for the development of behavior problems. The present study is not without limitations. First, the study population is “children of fathers with alcoholism seeking treatment” and so, the findings cannot be generalized to the broader population of “COAs.” Second, this study utilized maternal reports of child behavior problems which could be considered a study liability. Further, it has been found that parent report on childhood behavior predicts later valid means of assessment. Prevention programs aimed at improving the quality of the relationship with the nonalcoholic parent may be effective at protecting the child against socio-emotional maladaptation resulting from one's father's alcoholism. Interventions for this population may be particularly crucial as deficits in behavioral regulation, reflective of a genetic liability are often present in COAs. Such dysregulation may negatively impact the children's ease in developing secure parent-child attachments. By using these techniques with COAs, child resilience can be maximized. Future studies including samples of mothers with and without alcoholic partners may be able to better answer the question of the role of maternal alcohol problems in the development of behavior problems. Carbonneau R, Tremblay RE, Vitaro F, Dobkin PL, Saucier JF, Pihl RO, et al. Paternal alcoholism, paternal absence and the development of problem behaviors in boys from age six to twelve years. J Stud Alcohol 1998;59:387-98. Leonard KE, Das Eiden R, Wong MM, Zucker RA, Puttler LI, Fitzgerald HE, et al. Developmental perspectives on risk and vulnerability in alcoholic families. Alcohol Clin Exp Res 2000;24:238-40. Bornovalova MA, Hicks BM, Iacono WG, McGue M. Familial transmission and heritability of childhood disruptive disorders. Am J Psychiatry 2010;167:1066-74. Marmorstein NR, Iacono WG, McGue M. Alcohol and illicit drug dependence among parents: Associations with offspring externalizing disorders. Psychol Med 2009;39:149-55. Eiden RD, Molnar DS, Colder C, Edwards EP, Leonard KE. A conceptual model predicting internalizing problems in middle childhood among children of alcoholic and nonalcoholic fathers: The role of marital aggression. J Stud Alcohol Drugs 2009;70:741-50. Kumpfer KL, Alvarado R, Whiteside HO. Family-based interventions for substance use and misuse prevention. Subst Use Misuse 2003;38:1759-87. Hayward RA, Depanfilis D, Woodruff K. Parental methamphetamine use and implications for child welfare intervention: A review of the literature. J Public Child Welf 2010;4:25-60. Hale WW, Engels R, Meeus W. Adolescent's perceptions of parenting behaviours and its relationship to adolescent generalized anxiety disorder symptoms. J Adolesc 2006;29:407-17. Tarter RE. Are there inherited behavioral traits that predispose to substance abuse? J Consult Clin Psychol 1988;56:189-96. Eisenberg N, Fabes RA, Bernzweig J, Karbon M, Poulin R, Hanish L, et al. The relations of emotionality and regulation to preschoolers' social skills and sociometric status. Child Dev 1993;64:1418-38. Eisenberg N, Zhou Q, Losoya SH, Fabes RA, Shepard SA, Murphy BC, et al. The relations of parenting, effortful control, and ego control to children's emotional expressivity. Child Dev 2003;74:875-95. Rothbart MK, Ahadi SA, Hershey KL, Fisher P. Investigations of temperament at three to seven years: The children's behavior questionnaire. Child Dev 2001;72:1394-408. Barkley RA. ADHD and the Nature of Self-Control. Worcester, MA: University of Massachusetts Medical Center; 1997. Wong MM, Zucker RA, Puttler LI, Fitzgerald HE. Heterogeneity of risk aggregation for alcohol problems between early and middle childhood: Nesting structure variations. Dev Psychopathol 1999;11:727-44. Dawes MA, Tarter RE, Kirisci L. Behavioral self-regulation: Correlates and 2 year follow-ups for boys at risk for substance abuse. Drug Alcohol Depend 1997;45:165-76. Tarter R, Vanyukov M, Giancola P, Dawes M, Blackson T, Mezzich A, et al. Etiology of early age onset substance use disorder: A maturational perspective. Dev Psychopathol 1999;11:657-83. Tarter RE, Alterman AI, Edwards KL. Vulnerability to alcoholism in men: A behavior-genetic perspective. J Stud Alcohol 1985;46:329-56. Rothbart MK, Bates JE. Temperament. In: Damon W, Eisenberg N, editors. Handbook of Child Psychology: Social, Emotional, and Personality Development. New York: Wiley; 1998. p. 105-76. Tarter RE, Vanyukov M. Alcoholism: A developmental disorder. J Consult Clin Psychol 1994;62:1096-107. Caspi A, Moffitt TE, Newman DL, Silva PA. Behavioral observations at age 3 years predict adult psychiatric disorders. Longitudinal evidence from a birth cohort. Arch Gen Psychiatry 1996;53:1033-9. Mun EY, Fitzgerald HE, Von Eye A, Puttler LI, Zucker RA. Temperamental characteristics as predictors of externalizing and internalizing child behavior problems in the contexts of high and low parental psychopathology. Infant Ment Health J 2001;22:393-415. Martel MM, Nigg JT, Wong MM, Fitzgerald HE, Jester JM, Puttler LI, et al. Childhood and adolescent resiliency, regulation, and executive functioning in relation to adolescent problems and competence in a high-risk sample. Dev Psychopathol 2007;19:541-63. Mulder RT. Alcoholism and personality. Aust N Z J Psychiatry 2002;36:44-52. Wills TA, Dishion TJ. Temperament and adolescent substance use: A transactional analysis of emerging self-control. J Clin Child Adolesc Psychol 2004; 33:69-81. Goldberg D, Williams P. A User's Guide to the General Health Questionnaire. NFER-Nelson; 1988. Achenbach TM, Rescorla LA. Manual for the ASEBA School-age Forms and Profiles: An Integrated System of Multi-Informant Assessment. Burlington, VT: Research Center for Children, Youth, and Families; 2001. Buss AH, Warren WL. Manual for the Aggression Questionnaire. USA: Western Psychological Services; 2000. Malhotra S, Malhotra A. Manual of Malhotra's Temperament Schedule. Agra: National Psychological Corporation; 1988. Thomas A, Chess S. Temperament and Development. New York: Mrunner/Mazel; 1977. Sarkar AP, Sen S, Mondal S, Singh OP, Chakraborty A, Swaika B, et al. 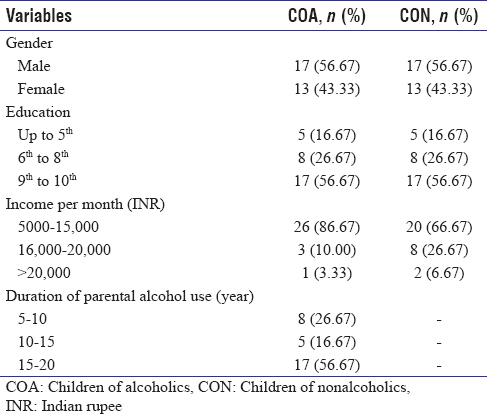 A study on socio-demographic characteristics of alcoholics attending the de-addiction center at Burdwan medical college and hospital in West Bengal. Indian J Public Health 2013;57:33-5. Health AC. Genetic influences on drinking behavior in humans. In: Begleiter H, Kissin B, editors. The Genetics of Alcoholism. Alcohol and Alcoholism. Vol. 1. New York: Oxford University Press; 1995. p. 82-121. Raman V, Prasad S, Appaya MP. Children of men with alcohol dependence: Psychopathology, neurodevelopment and family environment. Indian J Psychiatry 2010;52:360-6. Sugaparaneetharan A, Kattimani S, Rajkumar RP, Sarkar S, Mahadevan S. Externalizing behaviour and impulsivity in the children of alcoholics: A case-control study. J Ment Health Hum Behav 2016;21:112-6. Neena S, Rahul G, Ashok G. Emotional disturbances in children of alcoholics. Indian J Psychol Med 2006;28:46-50. Mukesh K, Yesudas KF, Palayat AM. Internalizing symptoms in children of alcoholics: A hospital-based cross-sectional study. Kerala J Psychiatry 2017;30:1-7. Chassin L, Rogosch F, Barrera M. Substance use and symptomatology among adolescent children of alcoholics. J Abnorm Psychol 1991;100:449-63. King SM, Keyes M, Malone SM, Elkins I, Legrand LN, Iacono WG, et al. Parental alcohol dependence and the transmission of adolescent behavioral disinhibition: A study of adoptive and non-adoptive families. Addiction 2009;104:578-86. Bountress K, Chassin L. Risk for behavior problems in children of parents with substance use disorders. Am J Orthopsychiatry 2015;85:275-86. Dishion TJ, Owen LD. A longitudinal analysis of friendships and substance use: Bidirectional influence from adolescence to adulthood. Dev Psychol 2002;38:480-91. Edwards WP, Leonard KE, Eiden RD. Temperament and behavioural problems among infants in alcoholic families. Infant Ment Health J 2001;22:374-92. Eiden RD, Edwards EP, Leonard KE. Mother-infant and father-infant attachment among alcoholic families. Dev Psychopathol 2002;14:253-78. Sroufe LA. The role of infant attachment in development. In: Belsky J, Nezworski T, editors. Clinical Implications of Attachment. Hillsdale, NJ: Erlbaum; 1988. p. 18-38. Patterson GR. A Social Learning Approach. Coercive Family Process. Vol. 3. Eugene, OR: Castalia; 1982. Conger RD, Wallace LE, Sun Y, Simons RL, McLoyd VC, Brody GH, et al. Economic pressure in African American families: A replication and extension of the family stress model. Dev Psychol 2002;38:179-93. Kim IJ, Ge X, Brody GH, Conger RD, Gibbons FX, Simons RL, et al. Parenting behaviors and the occurrence and co-occurrence of depressive symptoms and conduct problems among African American children. J Fam Psychol 2003;17:571-83. Zucker RA. Alcohol involvement over the life span: A developmental perspective on theory and course. In: Gaines LS, Brooks PH, editors. Alcohol Studies: A Lifespan Perspective. 1991. McMahon RJ. Diagnosis, assessment, and treatment of externalizing problems in children: The role of longitudinal data. J Consult Clin Psychol 1994;62:901-17. Narang RL, Gupta R, Mishra BP, Mahajan R. Temperamental characteristics and psychopathology among children of alcoholics. Indian J Psychiatry 1997;39:226-31. Tarter RE, Kabene M, Escallier EA, Laird SB, Jacob T. Temperament deviation and risk for alcoholism. Alcohol Clin Exp Res 1990;14:380-2. Blackson TC, Tarter RE, Martin CS, Moss HB. Temperament mediates the effects of family history of substance abuse on externalizing and internalizing child behavior. Am J Addict 1994;3:58-66.